This spring we're wrapping up a fly-date tour with some good friends of ours. 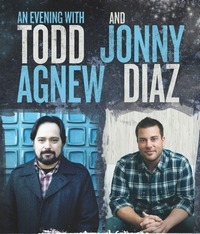 Todd and Jonny have been doing a very laid back, ministry focused tour sponsored by Food for the Hungry. A very simple show, with acoustic guitars and cajons, but a great opportunity to see the hearts of both of these fantastic artists! It's been a real pleasure for Invested Advance to serve them. Find a show near you.